I hope these carefully selected inspirational christmas quotes will, in equal measures, chill you out and help rekindle that warm magical feeling we've all experienced (and still secretly long for) when we were kids. The best bit of Christmas for me? Always the dinner; turkey, roast potatoes, gravy, stuffing, carrots, yes even the sprouts. Mmmmmm, oops think I just dribbled onto my Mac there. See you at the bottom of the page for some funny quotes about Christmas. If you don't make it (to the bottom of the page that is) have a good one. "Christmas! The very word brings joy to our hearts. No matter how we may dread the rush, the long Christmas lists for gifts and cards to be bought and given - when Christmas Day comes there is still the same warm feeling we had as children, the same warmth that enfolds our hearts and our homes." that makes giving worthy of the Christmas spirit." 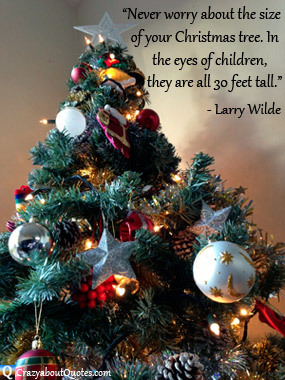 In the eyes of children they are all 30 feet tall." "Christmas isn't a season it's a feeling." to remind us that we're here for something else besides ourselves. in heart as well as body." waiting for me. You were handsome you were pretty. Queen of New York City when the band finished playing they yelled out for more. Sinatra was swinging all the drunks they were singing. We kissed on a corner. Then danced through the night." 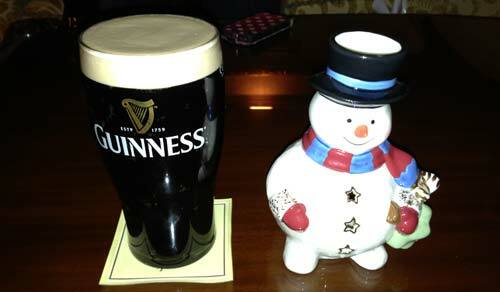 "And the boys from the NYPD choir were singing Galway bay. And the bells were ringing out for christmas day." Wow, those lyrics give you a little shiver, or maybe that's just me? That was some of the Fairytale of New York lyrics by the Pogues of course. I hope you were singing?